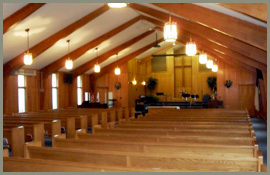 We hope you are thinking about visiting Cheektowaga Baptist. When you go to a new place for the first time it's nice to know what to expect! Dress up or dress casual...it's up to you. You'll see people in jeans and people in a tie. What you wear on the outside doesn't really matter, just be you. Come a little early, especially if you have kids. There will be someone at the door who can help you find your way around. We have a nursery that is staffed for both Sunday School and Worship. If you do have children for the nursery, you will need to spend a few minutes filling out a form and picking up a beeper just in case you are needed in the nursery. We also have an age-graded Sunday School for your children. Don't stop for coffee first. If you are the kind of person who likes to have a coffee in your hand at all times, you don't need to stop on the way to our church. We serve coffee and tea at absolutely no charge every Sunday morning. You will find it in Smith Hall just outside our kitchen so feel free to join us. Speaking of Bible studies, we have several on Sunday morning. We offer five Adult bible studies and one Youth Bible study. 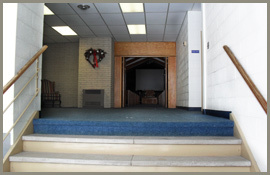 Again, the person greeting you at the door can direct you to any one of our classes. Pick up a Welcome Packet before you enter the Worship Center. These are available in the foyer of the church on the upper level. Our Sunday morning worship begins with what we call gathering music led by our Worship Leader and Worship Band. Be sure and pick up a copy of our church bulletin from one of the ushers as you enter the Worship Center. It is full of information about current ministries and activities at Cheektowaga Baptist Church. Our worship service is a mix of contemporary music with some classic hymns. We also have an adult choir that shares periodically in the worship service. 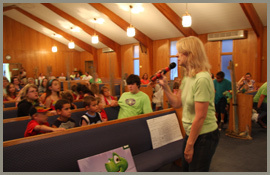 Following the worship in music any children below the 6th grade may attend our Junior church. If you have other questions before you come, just call our church office. We'd love to talk to you. We want you to feel at home. We're ready to welcome you just as you are. One of the things that you will notice as soon as you enter our doors is the fact that you are among welcoming and friendly people.